The immediate past Dean, Student Affairs of the University, Professor Sam Oluwalana has cautioned members of the academic community to beware of their consumption of some staple foods, as they could be poisonous. Delivering a Keynote Address at the 2nd International Summer School on Organic Agriculture, Professor Oluwalana warned that some Nigerian foods are deadly and as such serve as causative agents for various diseases. He pointed out that some helpless Nigerians, who consumed them suffer from what he termed, “Hidden Hunger Syndrome”. According to him, Hidden Hunger Syndrome is as a result of the deficiency in some nutrients in the body, making the world to “move away from chemical/medicinal healing to healing by eating healthy foods”. Professor Oluwalana disclosed that the best medicinal and healthy foods are those that have nutriceutical values. He described nutriceutical foods as organic foods, which prevent chronic diseases, improving health, while they delay the ageing process and increase life expectancy, among others. He revealed that organic foods contain more nutrients like iodine, vitamins and minerals, as against food cultivated using fertilizer, which lack the vital nutrients. 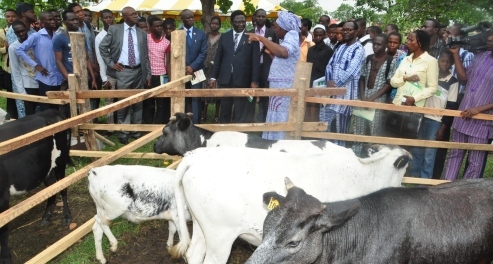 The University’s Vice-Chancellor, Professor Olusola Bandele Oyewole, who was represented at the occasion by the Deputy Vice-Chancellor (Academic), Professor Toyin Arowolo, implored the participants to gather useful information during the 11-day intensive training programme and educate the people on the benefits of organic agriculture. The Chairman of the FUNAAB’s Organic Agriculture Project in Tertiary Institutions in Nigeria (OAPTIN)’s Working Group, Professor V. I. O. Olowe, stated that at the end of the programme, participants will be better positioned, as good ambassadors, to advocate for the advantages of organic agriculture.